Vengeance Diagrams, sometimes shortened to Venn Diagrams, are the means to both plot against and kill the mark. They were first invented by Gwen Dyer to murder T. Notabill Livingworthy, who, before long, was found with his shoes and hat arranged in a triangle, having exploded into a puff of coloured smoke. The cloud has since dissipated, and everyone can breathe a little easier. Venn diagrams can be dangerous. This article in Venn diagram form. Nonethelesser, the dangers of Venn diagrams are still lurking. First and foremost to the observer, Venn diagrams provide a fiercely powerful way to plan. By showing the intersections of various different types and justifications of rage, as well as the date and time of the dead man (for he is doomed), and with whom he is copulating, the Venn diagram allows icing to be a piece of cake. Fortunately, it is very difficult to accurately construct a fourth or fifth-order diagram, and hence the public at large remains relatively safe from major attacks. The far more sinister capability of Venn diagrams is their inherent killing power, which is derived, as exemplified by Myst, from the general law that something looking powerful on paper has power in real life. More specifically, this fearsome power comes from channeling the energies of the two circles of hatred and one including the victim. These are not unlike the energies channeled by the satanic pentagram. For this, the Venn diagram draws upon the occult mysticism of the pyramid, the triangle, and the trienergies, which are themselves three in number, greatly multiplying the supreme power. Due to recent public crackdowns, Venn diagrams have luckily been suppressed to a maximal extent. However, they are still to be found, horrifyingly enough, in children's math textbooks, due to the unceasing malice of Houghton Mifflin before its reform and exorcism in 1989. No one is yet able to assess the true threat these schoolchildren pose who have gazed upon the Venn. 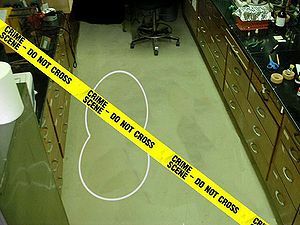 The legal status of those using the killer Venns is unclear internationally, because of the fact that a sufficiently sophisticated Vengeance figure can replace not just the corpse but the entire crime scene with null sets, effectively erasing any and all evidence. This danger was first postulated by Georgeo Cantor. The recognition of VD killings worldwide as perfect crimes has led lawmakers to take drastic measures, such as holding secret military trials for those suspected of even knowing someone who has employed the forbidden magicks. This would, of course, not apply to anyone (even suspected terrorists) except the occult. This page was last edited on 13 December 2011, at 16:56.